For both newcomers and veterans, we highly recommend getting a room at our host hotel. You can safely immerse yourself into your gaming experience, game as long as you like, and simply walk to your room for rest. A hotel room serves as a base of operations for the weekend... particulary for storing games and supplies. GobbleCon organizers work with the Hyatt to secure the best room rate possible for our attendees. Our contract provides for a certain number of discounted rooms per night, and a deadline by which those rooms must be reserved. We can't say it enough... BOOK YOUR ROOMS EARLY! When our block is sold, it's at the Hotel's discretion whether to provide more discounted rooms, and at what price. So the longer you wait, the more chance you have that the price of the hotel will be more than the original discounted GobbleCon rate. Partnering with the Hyatt helps bring us MORE rooms to accomodate the flocks of gamers looking to roost during their stay. We've secured a substantially discounted room rate for our guests that includes complimentary Guest Room Internet. Single through quad occupancy room - $119 per night. Regency Club Level - $169 per night. CALL 1-800-233-1234 and speak to an agent. Be SURE to ask for the GobbleCon rate. 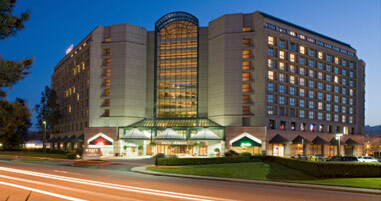 Book your room online at the Hyatt's special PassKey reservation site set up just for our event. BART - Take BART to the airport, and walk to the upper level of the international terminal where the shuttle busses stop. The Hyatt runs a shared shuttle bus with the Marriott that runs about every 20 minutes. Take the shuttle to the Hyatt. AIR TRAVEL - Whether you arrive in the international or domestic terminals, after you collect your bag, you'll need to take the elevator or escalator up to the 2nd level. Walk out the doors and cross to the center meridian. Follow the signs for "Hotel Shuttle Busses" and take the "Hyatt/Marriott" bus. CALTRAIN - Take CalTrain to the Broadway Station. From there, pick up SamTrans route 292 (North, towards the airport). The 292 will cross 101 and travel North on Bayshore Highway. Confirm with the driver the correct stop for the Hyatt. Discounted parking is available to GobbleCon attendees at $10 day. If you're STAYING at the Hotel, and you booked your room under the GobbleCon rate, you will use your ROOM KEY to get in and out priveleges to the parking lot. Do NOT use the ticket that you were issued upon entering the lot. Parking charges will appear on your bill at the $10 day rate. If you're NOT STAYING at the Hotel, but you're a GobbleCon attendee, then BEFORE you exit the parking lot, get your ticket validated at one of the stamp machines which will be located near GobbleCon Registration.